Finally Dwelvers 0.11 has been released! A lot have changed since the last version, we have new graphics, a new UI, and a new radial menu that is a lot more intuitive. This version is a bug testing version and will probably contain some nasty issues. Therefore it is not available on Steam yet. This is because I don't want to release a game that hasn't been properly tested to a big crowd that wants to enjoy playing the game without bugs. So Dwelvers v0.11.1 can now be downloaded from the website by those of you that have buyers account. If you want to be a part of the bug testing team and are owners of Dwelvers on Steam but don't have a website account then please contact me and I will set up an account for you. My plan is to use this upcoming week to bug-fixing, and when the week is up release a stable version on Steam. Once again, if you feel left out of from this release then please contact me. So here's some of the updates that have been made since the last release and that I haven't reported about before. I have been working on making the menus more clean by giving them a flat modern design, and the first thing I started working on was the launcher. When I was finished with the launcher I gave the game menu a shot. You can check it out here below. Please note that when you select "Start game" the tutorial have been disabled. It is because the voice acting wasn't consistent with the new UI in the game and it would only have created more confusion for new players. My plan is to release a level editor with the next big release (in a month or two), and with this a couple of campaigns. The campaigns will be created in such a way that they will teach the player the game as he goes along. So therefore I didn't want to spend an extra week fixing this tutorial when it would be replaced in the end anyways. If you recall earlier newsposts I made I talked about being able to select individual buildings tiles. So now instead of selecting the whole tile you are able to select a table, a farm gate, the room floor and more just by pointing on that object. 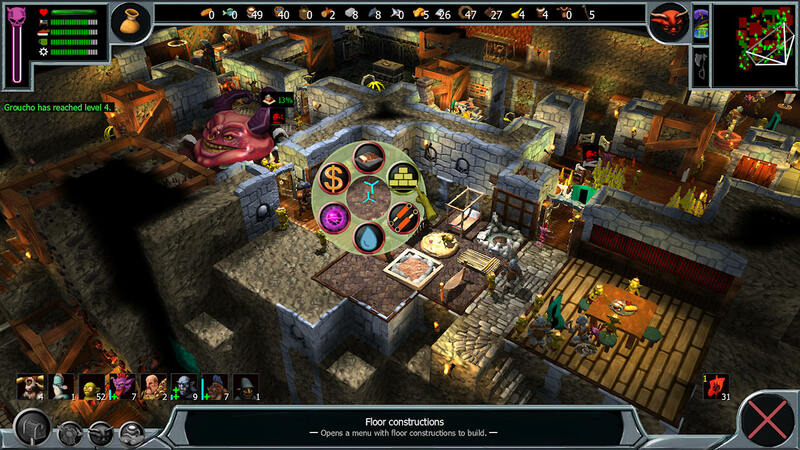 This gave me a lot more possibilities informing the player about individual buildings instead of packing together information about all the buildings, minerals and jobs on one tile. So what I did was expanding the info bar in the bottom so that it now can contain three rows. The first row shows the name of the building selected, the second row more details about the building and the third row technical information about the building, such as health, items delivered, if it attracts any creatures etc. This also enabled me to remove the hovering icons above the buildings which made the dungeon look a lot more cleaner. 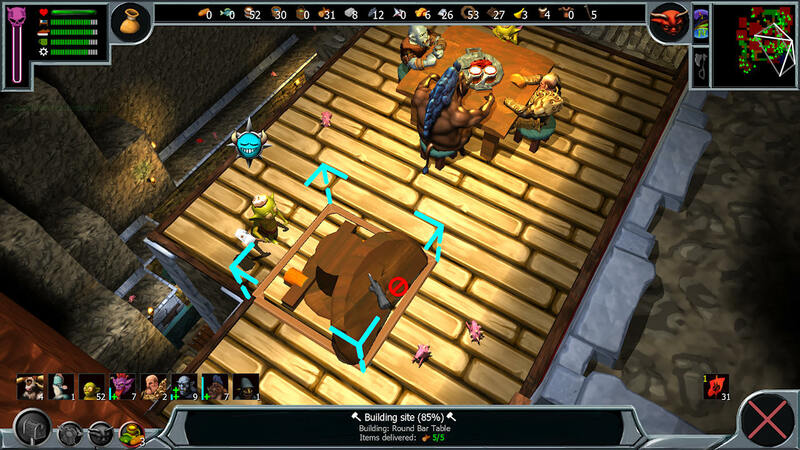 In the screenshot below you can see how it looks when the player is selecting a building site. Also, many of the building sites (not all) now have progression models for what building is being built. In this case it is a table, and we can see how the imp builds the table step by step. Now this is the big update. A new radial menu that contains almost everything! As it contains almost everything I was able to clean up the UI from all the building buttons in the bottom right, and this made the UI look a lot nicer and not as confusing in my opinion. The radial menu works as such that if you right click a tile you will get options that affects that tile. For example, if you right-click water you will not get the option to build rooms, because you can't build rooms on water. And right-clicking next to a wall gives you an option to build wall related buildings. At first I made it so that it filtered away everything that couldn't be built on the selected tile, but I noticed pretty quickly that this caused some confusion for me because the options got a new location in the menu everytime and was therefore harder to locate. So now it works like this, if you are able to do a fluid action such as dropping water on the ground, you will get the fluid menu, and in that menu you also have the options of building bridges as so on. So it is only the first radial menu that gets filtered, not the sub menus. As it was more than a year ago since the last release and I've been working on the game a little bit now and then it is hard for me to memorize all the changes that I've made. So you will most definitely find a lot more than new stuff than what I've been pointing out in this news post. There has also been a lot of under the hood changes such as me cleaning up the source code that will have no affect on you what so ever, except me being able to find bugs a lot faster One thing you may notice is that the game loads a lot faster, this may not be such a huge deal for you but it is for me as I'm restarting the game about a 100 times a day when developing it. As I said in the start of this news post this version is only released on the website because it needs some serious bug-testing before I release it on Steam. During this week I will not only fix bugs, I will also try to get some achievement into the game so that the players gets a better feeling of progression and reward. Well, that is it for me for today, I will be back tomorrow with some more information and answer all the questions you may have. 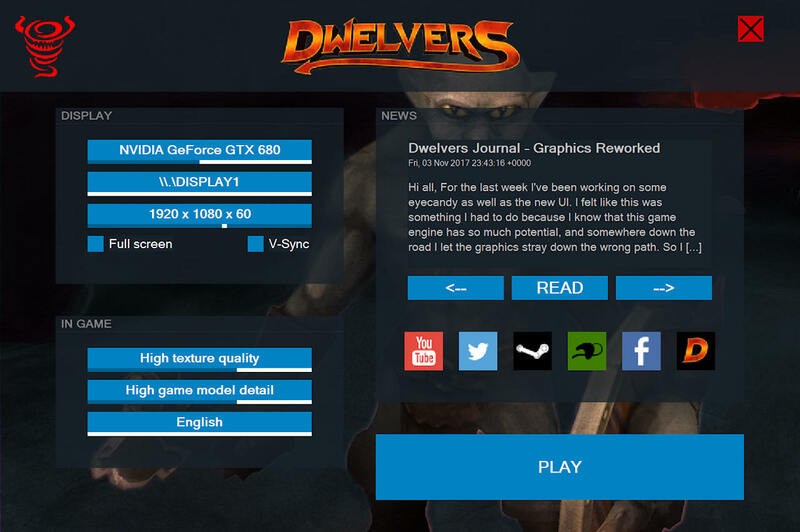 Dwelvers Alpha v0.11.1 is available for download only at the Dwelvers Website. Version 0.11.2 BT (Bug testing version) is now released! I have only had time to fix the game breaking issues in this version. So please keep reporting all the issues you may find and I will solve them as soon as possible. I noticed the debugger wan't packaged in the 11.2 BT so I just copied and pasted the one from my .10 Steam install. I think it would be best to focus on only the game breaking critical bugs before releasing to Steam considering the length of time between this and the last update. I'm sure people can overlook any cosmetic related bugs so they can get the latest update as soon as possible. Just my 2 cents. BTW I wonder how much more should I dig to make that ceiling fall down. We use this tool at my current job and it's fantastic I hope I can get it in there before the steam release. 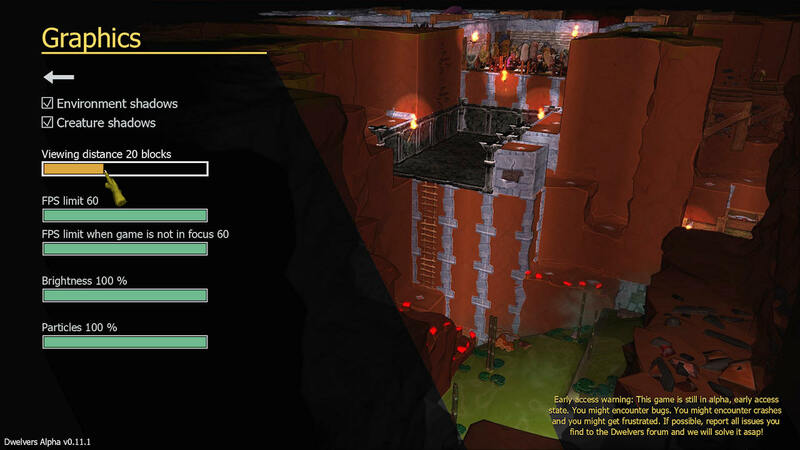 So what's your input on the new menu system and the new graphics? YESSS! This is what I was thinking about to implement, no need to make list of crashes and bugs, moving topics or writing game version in the topic, just changing prefixes (if it's not doing itself). I've now posted the news about the release on steam and facebook as well. I do like the new graphics, but I think you may want to rethink the permanent rock texture as it seems like the dirt is rock and the permanent rock looks like clumpy dirt next to the new dirt texture. The new walls are awesome, and I love what you did with the UI. My only criticism there is that all the quick tips should really show up in that bottom center display for consistency. Right now some do, some show up over the object, and then there are a bunch I would consider missing like when you scroll over the resource bar or the items. I agree Mello, I will fix the solid rock texture. And also look over the info bar in the bottom. Version 0.11.3 BT has been released! Version 0.11.4 BT has now been released! The new version, Love the new tile set you have as well the water but it is much harder with the light from the god hand being a little too bright, But even with the mother i think you have even reworked her ?. I got up to wave 14 on sandbox / normal and found that mother did not create new mobs, and i could only spawn new creatures out of the crypt. The prison i used to use as a way to get mother to spawn new units, This has now been fixed so besides using the prison to hold the new captured till dead mobs and then they get dragged to the crypt. It would seem i can only hold off the mobs for so long even with the very best sets of tools created for battle selected. I tried to get my mobs to mine some of the overworld of some tree's and that never happened but i did get one mob out into the overworld by placing down a flag, Its just that i could not really attack the overworld as my dungeon would take its time to recover from the last wave, but as the waves of mobs get quicker and my base not able to recover my base fell. Are you making sure you have enough beds and other items built that encourage population growth like training dummies, tables (although be careful there you can really muck up your food chain with too many), and statues for Orcs, bridges for Fishmen, statues and Impanzee rooms for Impanzees? I managed to run a normal game for 5 hours before the waves overcame my group. I have never really thought about the statues but unless they actually do something now then there is no need. I was basicly told by Rasmus that it comes down to room size and being able to feed the dark mother with minons you have caught via killing them on the floor. the number of beds do not really seem to be the production limit on creatures however it does come down to being able to recover them quickly enough after each wave. but thanks for the thoughts.